The Society's Museum is located on School Street in Northwood Narrows. The building was originally used as a library and is still owned by the Town. 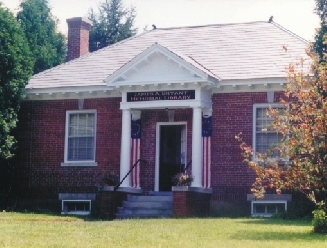 The James Bryant Library was made possible through a bequest from Rev. Bryant in the 1930s in which he stipulated that the library be located in the Narrows. This building served the west end of town for four decades until it was closed as a circulating library in 1989. Today, it continues to serve the towns- people through an agreement between the Library Trustees and NHS. Every year, new Northwood exhibits are offered to the public free of charge in July and August. Please see our 2007 events listing. EVERLASTINGS: The Cemeteries and Burying Grounds of Northwood, New Hampshire, compiled by L. Sherman Elliott, published ~1998. Available from the Northwood Historical Society for $25.00 (includes shipping). Benefits the Northwood Historical Society. A Guide to the History and Old Dwelling Places of Northwood, New Hampshire, 2nd Edition, 1992, by Joann Weeks Bailey, Peter E. Randall, Publisher. Available from the Chesley Memorial Library for $25.00 (plus $3.50 shipping & handling). Benefits the Friends of Chesley Memorial Library.